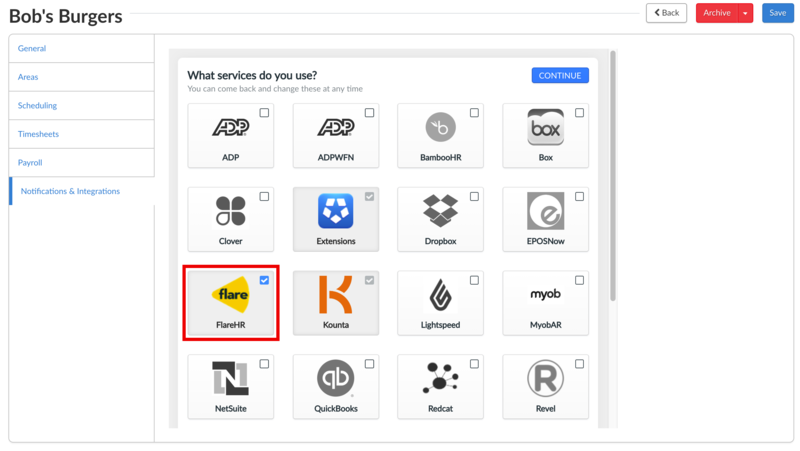 This guide shows our integration with FlareHR. Our FlareHR integration allows you to create and sync employees between systems. It also allows you to export timesheets to FlareHR. Follow the button below to learn how to export timesheets from Deputy to FlareHR. Before you begin, please contact FlareHR to retrieve your API key. Please keep this API key secure. You will need this to connect later on. 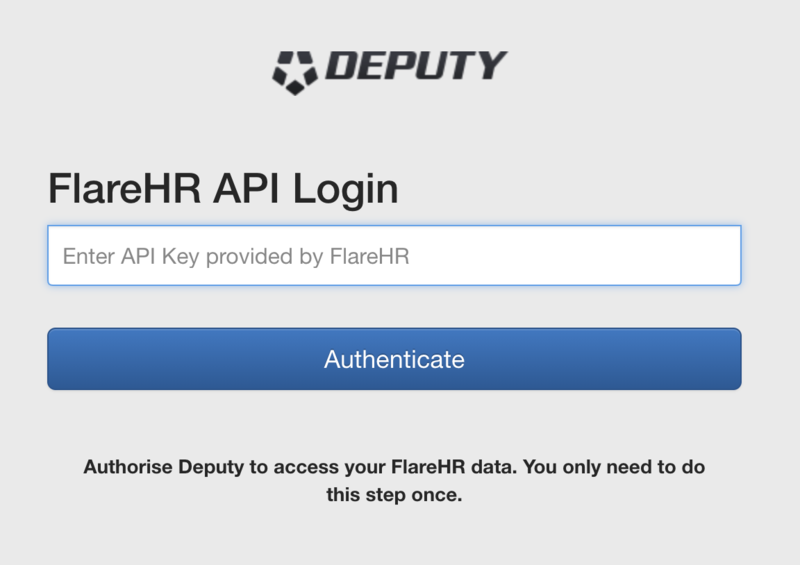 To connect to FlareHR, first log into Deputy and navigate to the Locations page. Click 'Edit Settings' on the location you would like to connect. In the Notifications & Integrations tab, select 'FlareHR', then click 'Continue'. In the following window, enter your API key as provided by FlareHR. Once a connection between employees has been made, it will be remembered, and any updates made in FlareHR will be updated in Deputy. Please note - FlareHR will now be the source of truth for this information. All updates should be made in FlareHR, otherwise they will be overwritten. The email invites toggle allows you to control whether new employees from Flare automatically receive an email invitation from Deputy, or whether the user wants to control this themselves. This can be helpful for initial setup. The Location field will set where Deputy should look for a primary location in Flare. The user can select ‘Location’, ‘Department’ or ‘Division’. Deputy will attempt to match this value to the name of a location in Deputy, and will add this as their primary location. The export code field allows you to select how to determine the payroll export code for the employee. If you are using FlarePay, this should be set to Employee ID. If you are using another payroll system, and have the employee’s payroll code in the employee number field in Flare, you can select that. If you have another system adding this information to Deputy, or you want to manually enter this detail, select ‘None’, and this integration will not edit the field. The first time you set up the integration, set your desired configuration, and hit ‘Save’. You must then run the integration once to kick it off, by hitting the ‘Run Now’ button. This will subscribe to the relevant areas in FlareHR, and do a complete employee sync. This may take some time on the first run if you have a large number of employees.